Sugar vs. Salt: What's Worse for High Blood Pressure? Sugar vs. Salt: What's Worse for Blood Pressure? From last many decades, doctors and scientists have been talking about the connection of sodium intake with heart diseases. It is also considered as one of main causes of high blood pressure. In the recent studies published in the BMJ journal Open Heart, the results revealed that it was none other than the beloved sugar which is not good for blood pressure. It is a known fact that around 200 years ago, the cases of hypertension were not visible at the level we see them today. It has been a proven fact now that the added sugar in the food items has more adverse effect on the health rather than sodium. The research revealed that an individual who consumes 10 to 24.9 percent of calories from the added sugar have 30% additional risk of cardiovascular diseases (CVD); while, those who consume 25% or more calories from the added sugar are almost three times at the risk of CVD. When a person consumes any food product with added sugar like soda, a high level of fructose is consumed. This is the culprit for increasing the LDL cholesterol (also known as bad cholesterol) levels. It additionally reduces the levels of good cholesterol or HDL cholesterol in the body which worsens the situation. A higher cholesterol level is directly connected to hypertension. Salt causes a higher level of blood pressure however, substantial changes were observed by just by controlling its intake. Having said that, salt is still not completely off the hook. High sodium levels in food forces the brain to store higher fluid content in the body which causes water retention and slowdowns the blood flow. This phenomenon has adverse effects on the kidney functions, sympathetic nervous system reactions, causes enlarged heart muscle and increases arterial stiffness. Hypertension can be easily prevented by making dietary adjustments. DASH diet helps in reducing sugar and salt content from the diet. 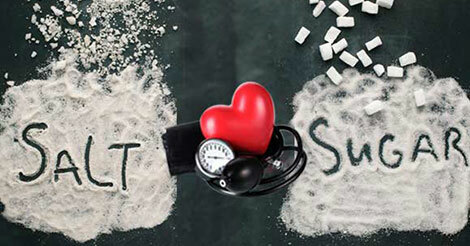 You can consult your doctor for a hypertension diet to be designed specifically for your body and metabolism. In India almost 29% of population suffer from hypertension. We can intentionally control intake of the high sugar content which causes high blood pressure in our daily routine for better hypertension management. Any disease can be managed by simply preventing the causes and by regularly going for a complete health check-up. For more information about prevention of fatal conditions, diet for hypertension, DASH diet, or regular medical check-ups, fill the query form and we will help you with it.